When it comes to disposing of old waste, doing so in an eco-friendly manner can appear impossible. Here at Go Rubbish Go. we employ the most environmentally friendly methods in Bow to ensure that your waste causes as little harm to the environment as is possible. We work hard to ensure that wherever we can, we make sure that your old items are re-used or recycled to keep landfill dumping at an absolute minimum. Over the course of our years of experience, our methods of E3 waste clearance have been tried and tested to ensure that we work at the most efficient rate possible. As a team of skilled professionals, we work on a tight schedule that allows us to get the job done and get your space cleared in a record time, without sacrificing quality of service. 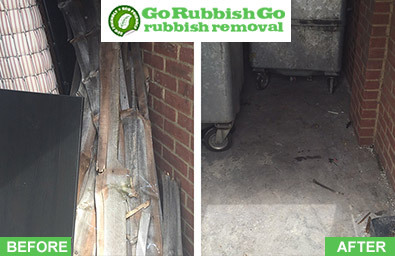 Our aim is to clear your rubbish and waste for the lowest possible price, giving you excellent value for money. 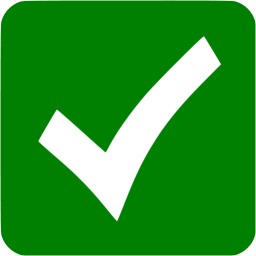 If you’re in need of a rubbish clearance in E3 or E14 area – whether its commercial clearance, garden waste removal or garage clearance – call us today on 020 8610 9182 for more information or a free quote! Rubbish accumulation is inevitable, but our E3 waste clearance experts can tackle it perfectly! After years of living in the same property in Bow, accumulating piles of old junk is inevitable. Don’t let lack of resources hold you back when trying to dispose of it all. Go Rubbish Go. can sort it all out for you in no time! Our waste disposal E3 offers not only strong staff to load away your waste items, but also all of the necessary equipment and paperwork to get the job done at a high standard. There’s no need to worry about a large method of transport to carry your old items, because we provide that too within our service in the E3 district. Our skilled staff members are fully trained to carry heavy equipment, so there’s no need to risk attempting it yourself. Came on time and did the job as previously agreed. Their rubbish clearance in Bow E3 is impeccable. Will recommend to anyone who needs a reliable and cost-effective service! 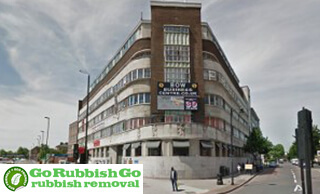 Let Our Bow Rubbish Removal Professionals Help You! 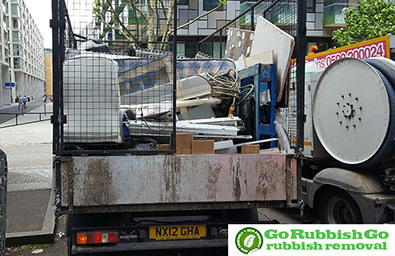 Our Bow rubbish removal services are a cheaper alternative to skip hire and with us, there’s no need to waste time applying for a skip permit. So why bother wasting money on other waste disposal facilities? Why waste your time trying to do it yourself? Our Bow waste removal professionals can get the job done for you, leaving any space you desire clear and empty. Whether it is builders waste clearance you need in the E14 region, or just a bit of help with a basement clearance, our rubbish disposal Enfield services are perfect for the job. To book us today, or for more information, call 020 8610 9182 now! We offer our waste collection in Bow, E3 at a price that will not be matched anywhere else in the area, and that’s a guarantee! The services we provide are unique, and go a step ahead of our competitors, but we don’t believe that this means you should have to pay through the nose for the services you receive. When you take advantage of our services you won’t only receive top quality service, you will save money as well! 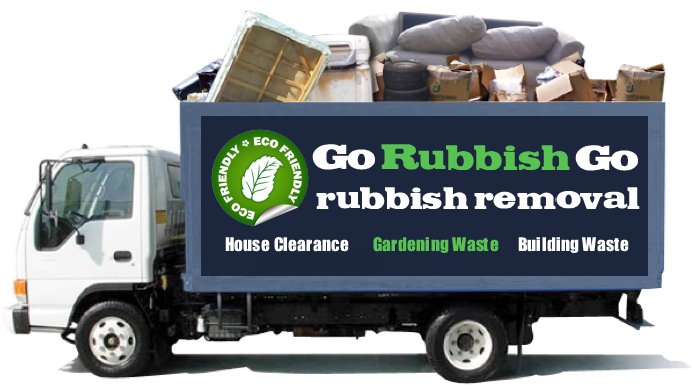 Rubbish removal has never been this easy and it has never been this cost effective, but changing the game is what we do! We don’t just want to provide a regular service, we want to provide the best service for you every time. Bow can be found in East London, in the borough of Tower Hamlets. The area was named after a bow-shaped bridge that is now a multiple lane flyover on a main road. Although now a largely built-up residential area in the past Bow used to boast meadows and a countryside atmosphere. To this day, one of the main attractions of the area is its vast number of pubs. Some of these include Bow Bells, Morgan Arms and The Widows Sun. The area is also home to a large number of good schools, which influence younger families to settle here. For visitors to the area, Bow offers a range of bed and breakfasts along with slightly more up market hotels as well.